It's a fact: the postal service in is at a crossroads. In many regions, it can't even stay afloat. Email has replaced letter writing, bills are paid online, and even physical packages are being trusted more and more frequently to privately-owned couriers. So how can the postal service become profitable again? By raising rates? By downsizing? By cutting out weekend delivery? No! They need to strap a jetpack to a snail and set him on a long, treacherous path reminiscent of a child's race car set, which is also floating in space. It's so obvious! In Snail Mail you control that snail, who is appropriately named Turbo. If you play with friends, they will be controlling his clones of many colours. 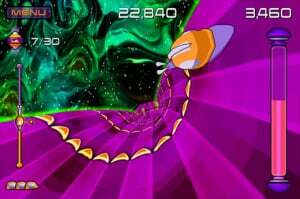 It's up to Turbo and his creepily similar brethren to brave the hazards of space as they collect packages and dodge obstacles, all the while being both salted and as-salt-ed. It's a difficult job, but somebody has to do it. The question is, do you actually want to be that somebody? We'll start with the good, as Snail Mail does contain a lot of promise. 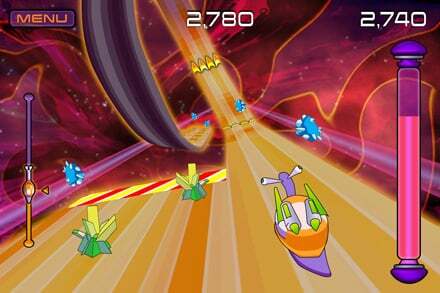 The visuals, for example, are stylish and colourful. They tend to zip by pretty quickly, but if you pause the game you can see that some great work went into the designs. (We particularly enjoyed the evil slugs in their spiked collars.) And as things are zipping by, the frame rate remains very smooth, which is a refreshing surprise for such an inexpensive title. Real work went into refining the experience, and it shows. The control, likewise, is tight. And we don't just mean "good," we mean BIT.TRIP tight. Whenever motion controls are involved, there's the potential for lag or sluggishness, but Snail Mail always responds well to even the slightest twists and turns. The problems, unfortunately, are tied to the core gameplay experience. Speeding along and collecting packages could be a fine — if somewhat basic — foundation for a great game. But here, the levels aren't different enough from each other to really provide a sense of achievement; each level feels like more of the same. The hazards might be more tightly packed and the powerups more scarce, but really there's not much difference between one level and any other. In the game Turbo rushes forward ahead without any impetus from you, and so your only interaction with him is limited to twisting the Wii Remote (or turning it, if you decide to use the Wii Wheel) to guide him left and right. You can also fire an upgradeable weapon with the A button, and since Turbo hurtles so quickly forward it's a good idea to just keep mashing it all the time and hoping for the best. 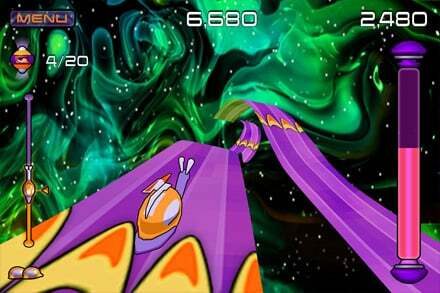 This endless forward motion can make the game pretty frantic, which we'd be lying if we said wasn't fun, but some unfortunate design choices can also make it pretty frustrating. For example, when you hit a ramp you launch into the air, and the camera angle changes in such a way that you can no longer see the track below you. The first time that this results in you falling directly into a pit, you'll understand why it's a problem. The 40th time it happens you'll just turn the game off. Also, for such a colourful game, not much thought seems to have been put into just which colours should be used. When flying so quickly ahead, it's difficult to tell the difference between the reddish packages (which you need to collect), the bluish salt mounds (which will slow you down) and the purplish slugs (which will kill you in one hit). Three different, more easily identifiable, colours should have definitely been used since Snail Mail gives you such little time to process each item visually. This unfortunate sameness also seeps into the game modes. While the inclusion of so many different modes is nice for the bargain price, the fact is that they all boil down to a too-similar experience, the only difference being whether it's score or time that's being measured, and whether or not the game ends when you die. Kind of disappointing that something called "death match" doesn't actually feel any different from "time trial." That said, the multiplayer aspect — up to four at a time — will certainly rescue this game for certain gamers. If you have people interested in playing with you, a good deal of fun can be had from the frantic action. When you're each just trying to out-perform the others, making it safely to the end of the level becomes less important than it is in single-player mode, and the design quirks become much less frustrating. Because the experience of any level is the more or less the same as any other there's no guarantee that your friends will want to play with you for very long, but, while they are playing, Snail Mail can certainly provide some good entertainment. 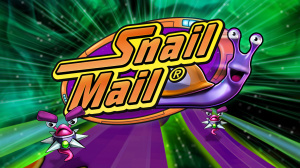 Snail Mail is by no means a bad game: its controls are tight, the action is fast paced, and the visual presentation is both stylish and smooth. Unfortunately the core gameplay is pretty one-dimensional, meaning your enjoyment of this game will rest almost entirely in the hands of those you play it with. For 600 Points it may well be worth a few rounds with friends, even if you never play it again after that. But anyone looking for a meatier experience that they can really sink their teeth into might want to pass up this paltry helping of escargot. I'm lovin' that art style. Nice review Phil. This game reminds me of Gremlin Graphic's "Trailblazer" from 1986. But how is this "Action, Adventure"? An Action-Adventure? Like Zelda? Or Tomb Raider? I would rather say it's "Racing, Arcade" If you really must put it into a genre. Are you enjoying the irony, fellow Canadians? I use to play that as a browser game. o.o It was pretty lame as a browser game to begin with anyways. This sounds exactly like that game HVS made for the WiiWare launch. Don't remember the name but it was pretty crappy too.